Rare opportunity to own a freehold barn conversion in the center of the Yorkshire Dales village of Clapham. Ivy Barn is well-priced and has scope for improvement, to provide a characterful and unusual home or holiday retreat. Given the location in this popular tourist destination, the property is ideal for investors seeking a holiday let opportunity. Available with no chain, viewing is highly recommended in order to appreciate the potential. Rare opportunity to own a freehold barn conversion in the center of the Yorkshire Dales village of Clapham. Ivy Barn is well-priced to reflect scope for improvement, to provide a characterful and unusual home or holiday retreat. Given the location in this popular tourist destination, the property is ideal for investors seeking a holiday let opportunity. Available with no chain, viewing is highly recommended in order to appreciate the potential. 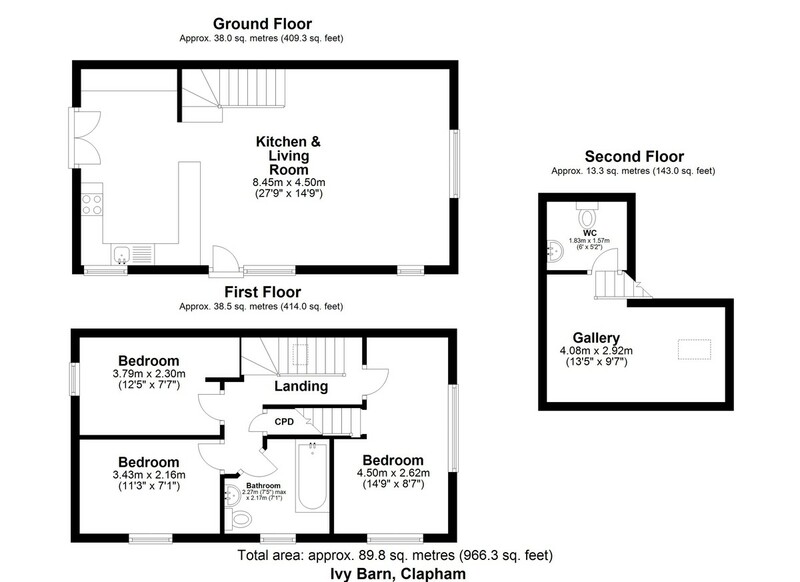 The ground floor is open plan providing a good-sized living room with kitchen area. On the first floor there are 3 bedrooms, with the master having a raised gallery area with stunning exposed beams and en-suite WC. There is a family bathroom, landing and under stair cupboard. Outside, a small and low maintenance yard provides parking for one car. The property has oil-fired central heating and is on mains electricity, water and drainage. Clapham is a picturesque village in the Yorkshire Dales - starting point for many of the most popular ascents of the mighty Ingleborough, one of the famous 3 peaks. Being estate managed, freehold properties are rare to market. The popular nature trail provides a beautiful local walk and access to the Ingleborough cave system. Connections from Clapham are excellent, with the A65 providing links to Skipton and Kendal. Clapham railway station is 1 mile away, with its links to Lancaster and Skipton. The Lake District can be reached in under an hour and the nearby Forest of Bowland AONB provides excellent walking and cycling opportunities. The village itself, is within the spectacular Yorkshire Dales National Park - popular with walkers, cyclists, climbers and cavers. Clapham has a well-regarded primary school and is within the catchment for excellent secondary education at the nearby market towns of Settle and Kirkby Lonsdale. KITCHEN & LIVING ROOM 27' 8" x 14' 9" (8.45m x 4.50m) Open plan ground floor currently arranged as a good-sized living room with kitchen area. Timber framed double glazed front door. 3 timber framed double glazed windows to the front aspect, 1 to the side aspect and double doors to the external yard. The kitchen area has a range of fitted wall and base mounted units. Integral cooker and hob. Washing machine. Sink and drainer. Oil fired central heating boiler. Stone tiled flooring. Radiator. The living area has 2 radiators. Exposed floorboards. Stairs to first floor. LANDING Landing area providing access to all accommodation on this floor. Roof light. Under stair cupboard. BEDROOM 14' 9" x 8' 7" (4.50m x 2.62m) Timber framed double glazed windows to the front and side aspects. Double bedroom with exposed beams and floorboards. Radiator. Carpeted stairs to the gallery area. GALLERY 13' 4" x 9' 6" (4.08m x 2.92m) Unusual gallery area with roof light and stunning exposed beams. Carpet. Radiator. Door to en-suite WC. EN-SUITE WC 6' 0" x 5' 1" (1.83m x 1.57m) WC. Wash hand basin. Extractor. Exposed beams. Vinyl flooring. BEDROOM 12' 5" x 7' 6" (3.79m x 2.30m) Smaller double or twin bedroom with timber framed double glazed window to the side aspect. Exposed beams and floorboards. Radiator. BEDROOM 11' 3" x 7' 1" (3.43m x 2.16m) Smaller double or twin bedroom with timber framed double glazed window to the front aspect. Built-in bunk bed. Exposed beams. Carpet. Radiator. BATHROOM 7' 5" x 7' 1" (2.27m x 2.17m) Family bathroom with timber framed double glazed window to the front aspect. WC. Wash hand basin. Bath with shower over. Extractor. Vinyl flooring. Radiator.